In cathodoluminescence (CL) imaging the wavelength-dependent intensity (spectrum) is often studied. In addition to the wavelength (color) of the emission, light is also characterized by a wave vector, the momentum and propagation direction of the wave. The direction in which light is emitted contains valuable information on how a nanostructured object emits and scatters light. It is also an important performance metric for plasmonic antenna structures and extracting band structure information from periodic systems, such as photonic crystals. Pictorial representation of the angle-resolved CL imaging mode found on the SPARC. 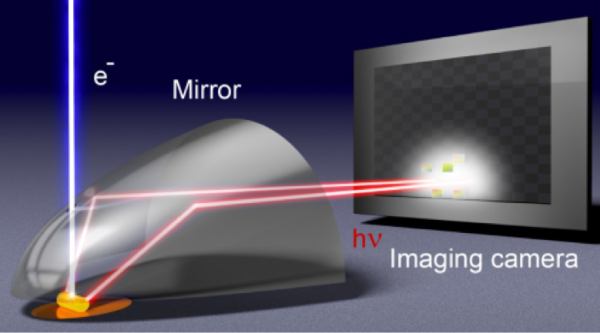 The CL emission is collected by an aluminum paraboloid mirror and redirected out of the SEM chamber toward a 2D CCD or CMOS imaging array in a parallel beam. This allows full retrieval of the beam intensity profile. Shown below is an experimental example of such a profile measured on a single-crystal gold substrate, corrected for mirror geometry. The experiment (on the left) demonstrates the full beam profile and the correlation with the theoretical example (on the right). This example used an SEM to energize the top of a gold nanopillar and measured the angle of the CL radiation coming off of the top of the pillar. In this example, the radiation was toroidal, with little CL signal perpendicular or parallel to the top surface. Every point within this profile can be directly associated with a specific emission angle in the upper angular hemisphere from which CL is collected. Such imaging is also known in optics as ‘Fourier’ imaging, referring to the fact that one image’s momentum (angular) space rather than real space. Beam intensity profile of a single-crystal gold substrate. The areas of missing data corresponding to the hole in the top of the mirror (center) and the opening of the mirror to the detector (bottom). The SPARC is the only commercially available solution for angle-resolved CL imaging because of the mirror and its positioning stage housed inside the device. The mirror collects 1.46π steradian of the upper hemisphere of CL emission from the sample. For example, a full sphere is 4π steradian, radiation can only be collected from the top half in an ideal situation, leaving 2π steradian available for collection. Losses from the opening of the mirror towards the detector and for the electron beam, along with the mirror being slightly above the same lead to around a ¼ loss, giving us 1.46π steradian collection area. This is equivalent to a numerical aperture of 0.96, 1.0 being perfect collection in air, and is able to collect zenithal angles up to 88⁰, limited from 90⁰ because of the hole at the top of the mirror for the electron beam The angular profile of gold corresponds to a toroidal pattern because the CL emission is dominated by transition radiation (TR), this angular pattern is shown above, and again, agrees well with theory. This measurement is not compatible with standard hyperspectral imaging, but color filters can be used to isolate certain spectral ranges since the angular profile can change profoundly for different emission wavelengths. The angle resolve measurements, including angle-resolved combinations with polarizers to study polarization effects, are exclusively available on SPARC as an all-in-one modular device. Delmic SPARC: Modular and upgradable cathodoluminescence system. Delmic SECOM: Extremely fast correlative microscopy with the highest optical quality and overlay accuracy.